Is this a different font? Do the tablet do not use the font from livecode? If you have not assigned a font to the stack or to individual controls, LC uses the system font which is different on every OS. If you did assign a font and the OS doesn't have that font, then it also falls back to the system font. You can either assign a font that exists on all platforms (there are only a few) or include the font file with the app. See "start using" in the dictionary. As well as what Jacque pointed out, different OSes display the same fonts differently to some degree (i.e. Mac/Windows/Linux, not sure about mobile), so even using those same few fonts may not give you exactly the same appearance, requiring you to make sure the final appearance is correct on the devices OS. I will search which fonts are equal to livecode on Win10 and Android. But is there a code to use this font for the whole stack? Or do I have to set this font to all fields and labels? the magic word is "inheritance", no code needed! not for every card and objects, then all cards and object "inherit"
this textfont property. This applies to ALL properties! just set it for the stack and you are done! I managed it to set the textfont for the whole stack. Can I also set the textfont for all fields (only fields) of the stack? I tried it but get only Errors. How is the syntax for this? of course you can set the textfont (and any property!) for each control in LC separately. That will overwrite the inherited property. There's a difference between setting the font of a field and setting it for the characters in the field. The first applies to any text, whether new or not, and the latter applies only to the current text. If is deleted and replaced, it will use the font inherited from a control farther along the hierarchy. Inheritance goes from character text, field, card, stack. The first one that has the property set is the setting that's used. Thought it is easier to set the textfont because set the textfont of stack "Test" to "Arial" worked fine. and I tried set the textfont of all fields of stack "Test" to "Arial"
You can shift-click all the fields on a card using the edit tool, then double-click any one of them to open the property inspector. In the text pane (looks like an "A") you can select the font and size and it will be applied to all the selected objects. Unless you need to change fonts dynamically in script, you only need to do this once during development. Here is a picture with the defaults in place and 3 controls. Once you set the text formatting of the stack, all of the controls automatically inherit that as Klaus pointed out, as well as any new controls you add. The exception will be the Title bar for the window, it will have the font and the size is determined by the OS setting. Next, let us say that you wanted to make the field text bold, but retain the font of the stack. Clicking on the control, in the text formatting area, simply click on bold. When I am setting up my design, I normally just drag one of each control out and make sure it looks how I think it should, then if I need more of that control, I ctrl/click/drag it to where it is needed, or copy/paste it, however if you wanted something like that you could just make a template control with the changes desired as well. None of the above requires any coding, although there is certainly nothing wrong with the loops described above, I save those for cases where I can't achieve my goals through layout. For example, as Jacque mentioned, if you needed to change text dynamically in one (or more) field(s), or if you needed to change the color of one (or more) button(s), then using case/select (for a few controls) or a loop for a large number of controls becomes a more viable option. 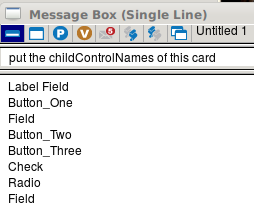 You may also want to look up childControl in the dictionary, in using loops this will allow you to target specific types of controls instead of looping through all the controls on a card or in a group, the output will give you the short name or ids.